Rich or poor, young or old, city bred or country born, there was still just one thing that really mattered at the end of each day. Love. After having careers as an award winning major league relief pitcher and more recently as a soap opera hunk, Noah Falcon returns to his small hometown to hone his acting skills in a small local production. Cricket Creek holds a special place in Noah’s heart. Not just because he was the high school baseball star, but because it is the only place he has ever felt himself. No team or manager to impress, no paparazzi to evade, just the good ole folks who knew Noah before he was a star and who still treat him like one of the gang. Well, that is everyone but Olivia Lawson, his old high school tutor. After running into Olivia a couple times, Noah wonders if this cute Southern girl can see that he is not all smoke and mirrors like most Hollywood types, but that he is still a genuine Southern gentleman. Olivia Lawson is an English teacher at Cricket Creek High School. Olivia loves her job and her town. 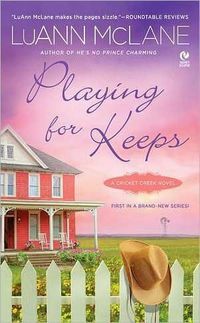 Sadden by the effects of the down economy and lack of tourism in Cricket Creek, Olivia hopes the production of a romantic comedy at the local theatre can help start a revitalization of her beloved home town. Determined to lend a hand, Olivia takes the female lead in the play. Her excitement over the play is quickly overshadowed by doubts when she learns that she will be playing opposite none other than Noah Falcon -- hot shot athlete and so-called actor … and years ago the high school senior who barely acknowledged her when she tutored him. Back in the day, she dreamed of prom night with Noah Falcon. But what jock wants to take a geek to a dance? At the site of a mature Noah Falcon, Olivia’s heart still goes pitter patter and her faces flushes. But can this hunky Hollywood guy see a heart of gold buried beneath a one-time geek? And can Olivia’s Southern charm and small-town-sturdy self win the heart of Cricket Creek’s golden child? First and foremost, I really loved this book! Cricket Creek is the perfect backdrop for this Southern romance. The interaction between Olivia and Noah is just fabulous. The emotions felt by Olivia and Noah run the gamut of lingering high school insecurities and complex uncertainty about life choices to the simple sweetness of holding hands during an evening walk and the steamy passion of making love, which makes the progression of their relationship pure magic. LuAnn McLane is my go-to author when I am looking for a feel good love story. Not only are her novels centered around romance (like every romance novel), but her novels are focused solely on the love of two people. That special love we all search for. The kind of love that makes you smile every single day. And while I love mystery and intrigue in romance, there is just something special about a simple, pure love story. In this novel, LuAnn’s masterful writing brings to life the quintessential charm of a small Southern town and the unique characters who call Cricket Creek home. I got such a kick out of all the secondary characters in this book. LuAnn is a master of creating lovable secondary characters that do not crowd the hero and heroine. These adorable characters just add flavor and flare. I’ve said it before, and I’ll say it again … no one does Southern love like LuAnn McLane! Southern Love - that's a beautiful way to express it. Great review Buffie! This sounds like a really sweet story. I'll definitely have to pick it up. I am a bit of a sucker for stories when the hero maybe didn't appreciate the heroine the first time around but after some time apart, his eyes are opened and he's like "whoa!" Plus, I love ugly duckling to beautiful swan stories. Buffie, this sounds like just the kind of story I need today. Thanks for a great review! I do so love any story about small towns because I get such a warm and satisfying feeling as I read them. As well, I think we all can identify with the characters. Thanks for keeping it real, LuAnn! Buffie, you know how I love small town romances. This one is definitely going on my list! Thanks for the wonderful review! I love a good feel good story, will have to check her out. Bella, this really is a great book. MaryBelle - Thanks! I thought "Southern Love" captured it perfectly. Gannon, I know I have talked about LuAnn for a while now. She is just a great author and one I think you would really like. Thanks so much, Lisa!! I hope you get the book and enjoy it. PJ, being a Southern gal I think you would really love this story. Thanks for stopping by Connie! I take it from your comments you have read some of LuAnn's books. Aren't that great?! You're welcome, Trisha. You really should check this one out! Hey Helen! Have you read any of LuAnn's books yet? If not, you really need to order some! Thanks for stopping by, Virginia! PLAYING FOR KEEPS is definitely a feel-good novel! Hi Pat! It is a really great book! And yes, the cover is just gorgeous. Great post! LuAnn McLane is a new author to me, but will definitely have to check her new book out after reading your review. Love finding out about more authors and books to try. Thanks for the recommendation! I have not yet read any of her books. I seems I will have to remedy that, Like the sound of this story. Hey Amber! I'm so glad I could introduce you to a new author. LuAnn McLane writes beautiful contemporaries with a Southern flare. In one of my reviews, I compared her books to funnel cakes -- sweet, sinful and utterly satisfying! Hope you enjoy this one! deerdoe, I sure hope you pick this book up. If you do, be sure to let me know what you think of it, okay?